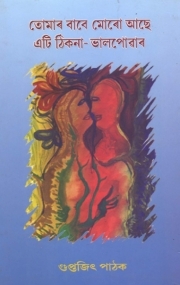 Description of "Tomar Babe Moro Aache Atie Thikana Bhalpowar (eBook)"
A poetry book which reflects love, affection, dream, divinity, identity of child life and humankind. Guptajit Pathak is a Poet, Script Writer, Writer, Scholar, Editor, Freelancer and an Assistant Professor in the Dept. of History, Kanya Mahavidyalaya, affiliated to Gauhati University, Assam. Mr Pathak authored more than one hundred books as Text, Reference, Edited, Poetry and for the Children, has participated more than sixty Local, Regional, National and International levels seminars and conferences and is the editor and member of different journals including UGC approved. He invited for many lectures, seminars and conferences and is a visiting faculty of Mahatma Gandhi University, Meghalaya for MA, PhD courses. Reviews of "Tomar Babe Moro Aache Atie Thikana Bhalpowar (eBook)"